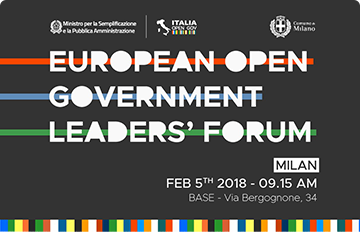 CEO of CiviQ, Vanessa Liston, participated as a speaker that the European Open Government Leaders Forum in Milan. The thematic fish-bowl conversation focused on how citizen participation can effectively foster innovation, improve public services and restore trust between public institutions and citizens at central, local and European level. The conversations were interactive and focused on developing proposals that could inspire political commitment. On the topic of ‘How do we implement participation?’, there was a lively discussion. Key discussants were Klaus VITT, State Secretary at the Federal Ministry of the Interior and Federal Government Commissioner for Information Technology, Germany; Lorenzo LIPPARINI, Councilor for Participation, Active Citizenship and Open Data, City of Milan, Italy; Federico GUERRIERI, Eurocities. Also speaking at the session were: Patrick O’DONOVAN TD, Minister of State for Public Procurement, Open Government and eGovernment, Ireland; Angela CONSTANCE, Cabinet Secretary for communities, social security and equalities, Scotland, UK.